CERN is taking part in a project, called ARIA, for the construction of a 350-metre-tall distillation tower that will be used to purify liquid argon (LAr) for scientific and, in a second phase, medical use. The full tower, composed of 28 identical modules plus a top (condenser) and a bottom (re-boiler) special module, will be installed in a disused mine site in Sardinia, Italy. The project is led by the Italian National Institute of Nuclear Physics (INFN) and was initiated to supply the purest argon possible to the international dark matter experiment DarkSide at INFN's Gran Sasso National Laboratories. DarkSide is a dual-phase liquid-argon time-projection chamber that aims to detect the possible passage of a dark matter particle in the form of a Weakly Interacting Massive Particle (WIMP) when it hits the argon nuclei contained in the detector. Since this WIMP-nuclei interaction is predicted to be extremely rare, the detector must contain only the purest argon possible, so as not to accidentally produce a spurious signal. ARIA has been designed to produce this extra-pure argon. Atmospheric argon contains many "impurities" such as water, oxygen, krypton and argon-39, an isotope of argon, which are all sources of unwanted signals. Argon from underground sources is already depleted from the argon-39 isotope by a factor of 1400, but this is still not enough for dark-matter research. ARIA is designed to purify underground argon by a further factor of 100, leaving only the radio-stable argon-40 isotope, by harnessing a very simple physical principle: the two isotopes have different volatility, which means that argon-39 will vaporise faster than argon-40 because it has one less nucleon in its nucleus. The argon gas is injected at the top of the column, where the condenser transforms it into liquid argon. The liquefied argon starts falling through a series of filters distributed along the column, where it is progressively purified. At the bottom, the boiler transforms the liquid argon back into gas and through a series of tubes brings it back to the condenser, where the process begins again. As the distillation occurs at cryogenic temperatures, the whole process takes place within a vacuum-insulated cryostat. ARIA's modules are being built at Polaris, a company on the outskirts of Milan, Italy. The modules are then brought to CERN, where, one by one, they are being leak tested by the Vacuum, Surfaces and Coatings (VSC) group of the Technology Department. On Friday, 24 November, the top and bottom modules plus one standard module were brought to Building 180 and lined up to precisely check their alignment, geometry and interconnection interfaces, prior to welding. 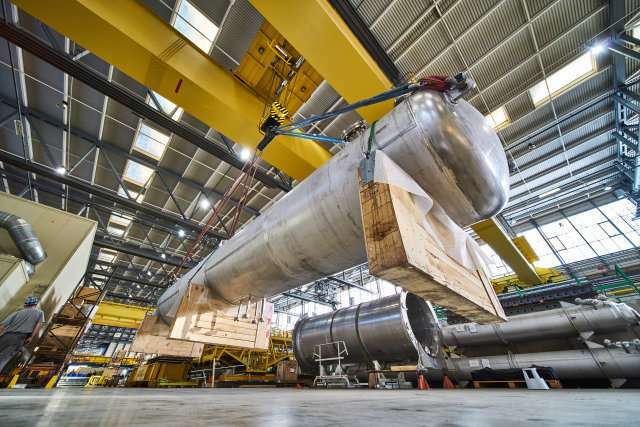 After this, the three modules will be taken to Sardinia, where they will be assembled vertically, initially above ground, to start operating and to test their functionality before assembling the complete column in the mine shaft. ARIA is expected to be fully assembled by the end of 2018 and to start operations in 2019. Once the technique is proven, many other air components, such as oxygen-18, nitrogen-15 and carbon-13, could be distilled by applying the same process. These elements have important applications in many fields of research and technology, including diagnostic techniques for the detection of cancer.